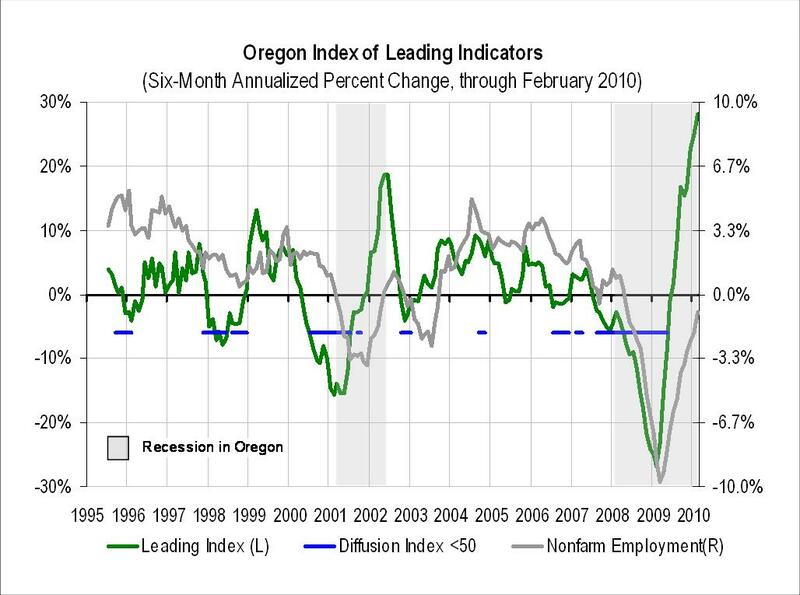 For the six months ending in February 2010, the Oregon Index of Leading Indicators increased an annualized 28.2 percent, following a revised 24.8 percent increase the prior month. This represents the eighth consecutive month that the index has been positive, representing a clear trend that the Oregon economy is or will be experiencing growth in the near future. While the Index’s percent change is at its historical high, it is important to realize the Index is designed to identify turning points in the economy and is not constructed to illustrate the magnitude of such changes. In February, ten indicators are registering positive values, up from eight the previous month. The only indicator currently in the negative range is Help Wanted ads. All other indicators are positive. The largest positive contributor continues to be the Industrial Production Index. Oregon withholding tax revenue and new Oregon incorporations continue to be up and down, but remain largely in the positive territory. Sustained improvements in unemployment initial claims, the Oregon dollar index, Oregon building permits and the semiconductor book-to-bill ratio have driven the Index’s increases in recent months. Following historical patterns of the Index, it is to be expected that employment growth will resume in Oregon in the near future. Note: The Leading Index values (green line) are graphed on the left axis with a range of -30% to +30%. Nonfarm Employment values (gray line) are graphed on the right axis with a range of -10% to +10%. Our office’s OILI is methodologically consistent with the U.S. leading economic index series produced by The Conference Board and also the University of Oregon Index of Economic Indicators. The UO Index has also been steadily increasing in recent months, providing another signal of an improved outlook for the Oregon economy. For the full OILI report, please visit the Oregon Office of Economic Analysis’ website. This is a ridiculous chart to describe possible change for the future. What it looks like from first glance is that today is “better” than any other day in the past 15 years according to the indicators. Instead of conveying the information in an easy-to-describe manner, you are choosing to use this chart to “catch the eye” and then use the words around it to describe what it means. Why don’t you try and use the same numbers on both sides of the chart to show truth? Overall, the Index is used to identify turning points in the economy and is not used as a basis to predict the magnitude, or strength, of the recovery or downturn. Given that the Index is calculated on a 6 month basis – that is how are the indicators performing today versus 6 months ago – and the severity of this recession, the percentage changes for the Index are currently quite large. The fact that 10 of the 11 indicators have improved over the most recent 6 months also contributes to the overall Index increase. Additionally, the Index has larger overall volatility than seasonally adjusted Total Nonfarm Employment. By placing each series on a different axis, it allows for a better illustration of the changes, particularly for Total Nonfarm Employment. I realize you are trying to show the “magnitude” of the indicators. However, the difference, for instance, of the Leading Index (L) in the past 6-12 months shows a span from -10% up to +10% in the farthest right point in this graph. By zooming in the graph on the right to span only -10% to +10% (instead of being equal to the graph on the right of -30% to +30%) it makes this current “magnitude” SEEM bigger than the greater gain between 2001-2002 when it went roughly up from -15% to +19%! Put the same numbers in the columns on the right as there are on the left and we will be able to see the correct trend upward. Thank you for explaining your issue with the graph, I appreciate you pointing this out as it may be an issue others have. In future postings I will make sure to prominently label or explain the different axes. The two different series (Leading Index and Nonfarm Employment) are graphed on two different axes. The (L) refers to the Leading Index being graphed only on the left axis with a range of -30% to +30%. The (R) refers to the Nonfarm Employment being graphed only on the right axis with a range of -10% to +10%. Currently, the Leading Index has a value of +28.2% while Nonfarm Employment is -0.9%. Again these percentages refer to the annualized six month change (August – February). The Leading Index’s value of +28.2% is the series’ historical high, however as previously mentioned, this does not represent the strength of the emerging recovery, rather it is simply a signal of future economic growth. In summary, the Leading Index (green line) values are measured on the left axis while the Nonfarm Employment (gray line) values are measured on the right axis. I hope this helps clarify the graph and I will make changes to point this out to other viewers. Thanks so much. I think it would help greatly to keep them both on the same axis for the clearest communication. The numbers all fit for it.